Useful entrance porch ideal for taking off coats and shoes before entering the main home. Generous lounge with ample space for a dining room table, sofas and lounge furniture. Great space for relaxing and entertaining. Spacious hallway with doors leading to the rear garden and kitchen. Useful cupboard which is currently be utilised as utility cupboard with lighting and plubing/power for washing machine/tumble dryer. Stairs rising to first floor. Modern shaker style fitted kitchen with range of wall and base units with complimentary oak effect worksurfaces. Integral gas bob with electric oven under and extracor over. Integral sink/drainer unit with mixer tap. Window to rear aspect overlooking the garden. Space and plumbing for fridge/freezer and dishwasher. 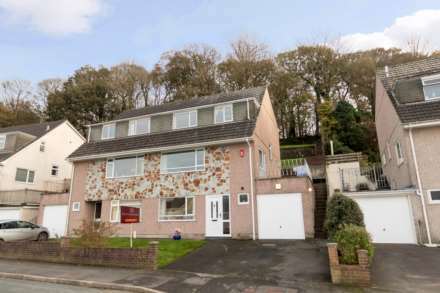 Double bedroom, window to rear aspect with lovely elavated views. Storage cupboards x 2. Double bedroom. Window to front aspect. Spacious modern four piece bathroom comprising, white panelled corner bath with mixer tap and shower attachment, corner shower cubicle with mains shower, pedestal hand wash basin and low flush w.c. Enclosed low maintenance rear garden mainly laid to decking and patio. Ideal for sitting out and enjoying summer evenings.